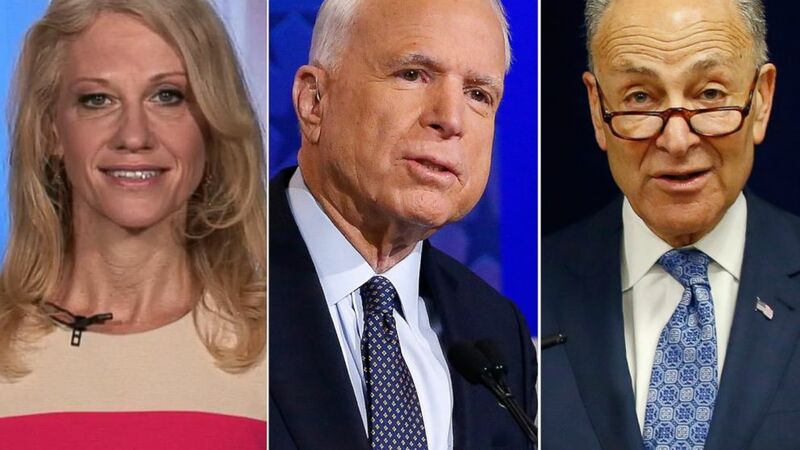 A rush transcript for "This Week" on January 22, 2017.
camera (ABC News | AP Photo) Pictured (L-R) are Kellyanne Conway in New York, Dec. 2, 1016, Sen. John McCain in Phoenix, Oct. 10, 2016 and Sen Charles Schumer in New York, April 4, 2016. THIS IS A RUSH TRANSCRIPT FOR 'THIS WEEK' on January 22, 2017 and it will be updated. UNIDENTIFIED MALE (voice-over): Starting right now on THIS WEEK with George Stephanopoulos. UNIDENTIFIED MALE (voice-over): Donald Trump takes the oath. TRUMP: This American carnage stops right here and stops right now. UNIDENTIFIED MALE (voice-over): Stark promises. TRUMP: From this day forward, it's going to be only America first. UNIDENTIFIED MALE (voice-over): And gets to work. TRUMP: We're going to start winning again and you're going to be leading the charge. UNIDENTIFIED FEMALE: Not my president. UNIDENTIFIED MALE: -- after massive protests, can he unite a divided America? UNIDENTIFIED FEMALE: But the president is not America. We are America. UNIDENTIFIED MALE (voice-over): Tough questions ahead for counselor to the president, Kellyanne Conway, Senator John McCain and Senate minority leader Chuck Schumer. After the transfer of power: a new administration. What’s first on the agenda for Number 45? From ABC News, it's THIS WEEK. Here now, chief anchor, George Stephanopoulos. GEORGE STEPHANOPOULOS, ABC HOST: Good morning. What an extraordinary start to this new presidency. The day after his inauguration, President Trump met with massive protests. Hundreds of thousands in the Capitol for the Women's March on Washington. Hundreds of thousands more in New York, Chicago, Los Angeles; cities across the country and around the world, from Paris to Sydney, Australia. The president ignored the protests. But on his first full day in office, he used his bully pulpit to deny reality, declare war on the press. TRUMP: I have a running war with the media. And they sort of made it sound like I had a feud with the intelligence community. And I just want to let you know, the reason you're the number one, stop, it is exactly the opposite, exactly. STEPHANOPOULOS: Reports of a feud were based on Trump's own statements. During the transition, he accused the intelligence community of conducting a political witch hunt, questioned their, quote, “intelligence.” He suggested the CIA director leaked damaging material on him and compared the agencies to Nazis. TRUMP: I think it's a disgrace. And I say that and I say that. And that’s something that Nazi Germany would have done and did do. STEPHANOPOULOS: Trump also inflated his inaugural crowd (ph) to the CIA and opened a new front with the press. TRUMP: It looked -- honestly, looked like a million and a half people. Whatever it was, it was. But it went all the way back to the Washington monument. And I turned and I, by mistake, I get this network. And it showed an empty field. And it said we drew 250,000 people. Now that's not bad. But it's a lie. So we caught them. And we caught them in a beauty. And I think they're going to pay a big price. STEPHANOPOULOS: Hours later, the president sent press secretary Sean Spicer to the podium for his first White House briefing, where he called the press “reckless,” “shameful,” accused some of sowing division with false narratives. SEAN SPICER, WHITE HOUSE PRESS SECRETARY: Yesterday, at a time when our nation and the world was watching the peaceful transition of power and as the president said, the transition of the balance of power from Washington to the citizens of the United States, some members of the media were engaged in deliberately false reporting. This was the largest audience to ever witness an inauguration, period, both in person and around the globe. STEPHANOPOULOS: The facts say otherwise. There, on the left, is Barack Obama's first inauguration in 2009 at noon. On the right, the matching shot for Donald Trump's inauguration at the exact same time. According the Nielsen ratings, 30.6 million people tuned in to watch Trump take the oath of office. That is more than four years ago but fewer viewers than Obama in 2009. And both were dwarfed by Ronald Reagan in 1981. And Washington Metro officials say they had about 571,000 riders on inauguration day. That’s down from 782,000 in 2013 and more than 1 million in 2009. Spicer closed the briefing with a warning. SPICER: There's been a lot of talk in the media about the responsibility to hold Donald Trump accountable. And I’m here to tell you that it goes two ways. We're going to hold the press accountable as well. STEPHANOPOULOS: Spicer then left the briefing room without taking any questions. But this morning we do have counselor to the president, Kellyanne Conway. She is here this morning, coming to us from the White House. Thank you for joining us, Kellyanne. So why did the president choose to give that speech at the CIA yesterday? And why did he choose to have Sean Spicer make that kind of a statement? STEPHANOPOULOS: But why did he choose to not tell the truth about press reporting on his feud with the intelligence community? That reporting was based on the president's own statements. CONWAY: The president went to the intelligence community yesterday to establish good relationships with them. And we had over 1,000 requests to attend. We could only accommodate a few hundred. He will be back. He got a standing ovation. And it’s really time for him to put in his own security intelligence community. We really would prefer the intelligence community that is going out the door to be much more respectful toward the president and his vision in moving forward. We're not really thrilled with the leaks that have come out with the last several weeks or months. And we think in the interest of keeping us all safe, George, that the intelligence community that we saw on their feet yesterday, welcoming President Trump for his rousing speech, is the one that we look forward to working with. STEPHANOPOULOS: You mention that -- you mentioned the outgoing officials. And as a matter of fact, former CIA Director Brennan did put out a statement yesterday. Here’s the statement from his aide, Nick Shapiro. “Former CIA director Brennan is deeply saddened and angered at Trump's despicable display of self-aggrandizement in front of CIA's Memorial Wall of Agency Heroes. CONWAY: I thought that was just an unremarkable, spectacularly disappointing statement from the outgoing CIA director. George, does that statement and the very vituperative language included therein, does that improve relationships with the intelligence community? We have an outgoing CIA director, sound like a partisan political hack about the President of the United States. I really think everybody needs to take a step back and a very deep breath, George, and think about the -- what their words are. You had President Trump in his inaugural address, calling for unity, patriotism, giving America back to its people, its government back to its people. And we have the outgoing CIA director making a statement like that, using that type of vocabulary. How in the world does that improve relationships with our intelligence community? STEPHANOPOULOS: -- while we’re still on the intelligence community, you know, several intelligence agencies and the FBI are now investigating possible contacts between Trump associates and the Russians during the campaign. Will President Trump pledge to allow those investigations to go forward without any interference from anyone in the White House? STEPHANOPOULOS: But these are -- these are -- these are in the -- in the government. These are the agencies of the government of your administration, who are now investigating. CONWAY: Well, same thing. We're not going to comment on that if they feel that they need to do that. But I will say that these media reports struck us as brand-new information. We had no idea what's going on. I was the campaign manager, contemporaneous with some of those events. And I assure you that I wasn't talking to Moscow. I was talking to people in Macomb County, Michigan, which is how the president became the president. STEPHANOPOULOS: So you’re confident nothing will come of this investigation? But you’re saying the White House will not interfere with it in any way? Let's talk a little bit more about what happened yesterday in the White House briefing room and Sean Spicer’s briefing. Was that the president's idea? CONWAY: Well, the president supports his press secretary and his press operation, obviously. And I think that our press secretary, Sean Spicer, was making the point that accountability has to go both ways. You know, George, just the day before in the Oval Office, while the president was signing executive orders, we allowed a press spray in. I was there. And sure enough, a press pooler gave a false report, that the bust of Martin Luther King Jr. had been removed from the Oval Office. That is just false. And it is dangerous and destructive on day one for the press to be reporting false information like that. CONWAY: -- the bust of Churchill had been returned and the bust of Martin Luther King Jr. was also there. That press pooler has apologized but the damage was done. STEPHANOPOULOS: Well, the point there is I think you're right. He probably shouldn’t have reported it if he wasn't positive. But when he was called on it, when he found out the truth, he did apologize on that. I do want to get to this issue of accountability, though, because you all make that point often. But you had instances yesterday, where both the president and Sean Spicer talked about the reporting on the crowd side and repeated things that just aren’t true. CONWAY: George, the crowd size it’s actually not a very animating topic to me for a very simple reason. He had hundreds of thousands of people here. There’s no question. I mean I was on the platform where the president was. We saw crowds as far as the eye can see. STEPHANOPOULOS: I completely agree with that. Let me just point -- let me just step in there because I completely agree with that. We spent 11 hours on the air on Friday, during the inauguration; barely talked about the crowd size, if we brought it up at all. We spent time talking to people in the crowds. The question is, why does the president choose to talk about that at the CIA? Why does he send his press secretary out to talk about it in his first White House briefing and say things that aren’t true? CONWAY: And, George, I would just say about crowd size. First of all, there was rain that -- the downpour that was reported. And I think it deterred many people from coming. But there were hundreds of thousands of people here; more importantly, 31 million people watched this inaugural, I’m sure including watched ABC's coverage of it according to Nielsen. That is far above the 20.5 million that watched President Obama's second inauguration. And many other people are watching inaugural festivities on other screens -- on their phones, online. So, we're very confident that the crowd sizes in the historic election of Donald Trump -- and it was historic based on projections that were given, and certainly based on the fact that we, for the first time, have a non-politician in the White House. I think the crowd size argument is not so important as what he's going to do this week as president of the United States. STEPHANOPOULOS: Again, I completely agree, that's why I'm asking why he chose to make his first speech about it and the first press briefing about it? CONWAY: At the same time, George, that did dominate media coverage by many yesterday, a day after the inauguration. And there are plenty of people, you saw the march yesterday, plenty of people who are trying to delegitimize this president. And honestly, it doesn't matter, because he's man of action. And watch what happens just in this first week. Presidents are judged by their accomplishments. But I would tell you, the great deal of interest that has attended Donald Trump through his candidacy, and now his presidency, continued in terms of 31 million people watching this inauguration on TV. That is far and above what President Obama had in his second inauguration. But, you know, I just think -- look, I want good relationships with the press. I'm here, if in part, for that reason. But it does -- it has to be a two-way street. And when I see Twitter feeds, when I see words that are people are using to describe this president, it is incredibly disrespectful to the office. Just watch what he does. He's going to end this week at the GOP House and Senate retreat. He'll meet with his first foreign leader here at the White House, Theresa May, the prime minister of the United Kingdom, the two came in similarly, through Brexit and through this movement here in the United States. People want the government to go back to the people. His speech called for unity. It was uplifting. And it called about patriotism and giving power back to the people. And think folks should look that respectfully and try to give us some coverage accordingly. STEPHANOPOULOS: We are going the watch what the president does. We're going to watch what the president says. What I'm talking about is when the president speaks at the CIA and says things that are not true, when his press secretary goes to the podium, repeats things that are not true, is that OK with the president? And isn't it our responsibility in the press to call, to hold them to account? To hold the press secretary to account for saying factual things from the White House podium? CONWAY: George, are you referring to the crowd size again when you say things that aren't factual? STEPHANOPOULOS: What the president said yesterday at the CIA, he said that the press was falsely reporting about a feud, that was based on the president's statements. What Sean Spicer said yesterday from the White House podium, he cited wrong facts about metro ridership. He said this was far and way the most viewed inaugural ever. That is simply not true if you look at the Nielsen ratings from 2009 or 1981, if you look at the pictures of the crowd, that is factually not true. CONWAY: We're talking about the same topic in a week when this president is going to work on replacing Obamacare, which has helped millions of people lose their doctors, their plans, their insurance. He's going to work on infrastructure, building the wall. He's going to meet with foreign leaders. We're still talking about crowd size. And I just want to say, I'm a pollster by trade, so I'm into things that are actually quantifiable. And here are the numbers that matter, the numbers that matter are the 2,600 counties he won, the 31 of the 50 states. And by the way, the other numbers that matter that hear from these women marching around Washington yesterday, are the 16.1 million women in poverty, are the millions of people who don't have health care after 8 years of President Obama. Donald Trump has been president for about 8 hours. President Obama was here for eight years. So, if want to talk about numbers that matter, it's quantifying all the losses the women who have slid into poverty, those who can't find meaningful work, and their children who deserve a better life, that's why I am here at this White House. I want to talk about things that are quantifiable, not a bunch of metro riders and crowd sizes. STEPHANOPOULOS: Again, it was the president who brought up crowd size. One final question on this, does the president believe it is important for his press secretary to be factual from the podium and to take questions from the podium? CONWAY: Yes, he does . of the media to be calling our press secretary a liar and worse on Twitter and Facebook and elsewhere and in articles. That is not the way to start relationships with the press. I believe in a free and open press. People have to cover the presidency. Respect the office and its current occupant. And we need to it be a two-way street. We have not been treated very well. This man is the president of the United States. If people would just go back, George, and listen to and watch his inaugural address again, that goes for everybody, calling for unification, being aspirational, talking about giving power back to the people. Look, I know he's coming to Washington. Seen in a way no one ever has. And the institutions and the lethargy and the stateism that is many of the establishment here is going to be shaken up. And I know people are wondering what will happen there. But we need to have a two-way street here with the press. And I look forward to that. And I appreciate the platform on your network and others, and look forward to an open and honest relationship. And we can't invite a press pool on the first day of the Oval Office with the president of the United States signing executive orders and then a big lie told about the bust of Martin Luther King Jr. days after our president, Donald Trump, met with Martin Luther King III in New York and had an incredibly powerful and constructive conversation with Martin Luther King Jr.'s son saying that he wants to support this president, that he believes he must unify the heal the nation. And then you have a bunch -- you have a bunch of people from the press writing these snarky articles that were also false. It has to go both ways and it has to start right now. You're right, we've spent enough time on this right now. I do want to get to a question on Obamacare. You had the president's executive order signed on Monday. And a lot of people were trying to figure on Friday, a lot of people trying to figure out what exactly does that mean? We know that on its own, the Obama administration chose to stop enforcing the employer mandate. Will President Trump stop enforcing the individual mandate? STEPHANOPOULOS: So, he'll stop enforcing that mandate? But look, we want to make very clear to everyone, that those who are relying upon coverage will not lose it. But you know many people have already lost their health care, millions already lost their health care, because they have it and can't use it because of the explosive skyrocketing premiums, or they literally, George, lost their doctors or insurance plans or their access to health care through Obamacare. We hear from the millions of people every day that have lost their health care, their plans, basically got drilled down to 28 hours a week so they can't access the health care that employers are supposed to provide. We want to help those millions of people. We have received through our transition over 225,000 comments and pleas from Americans, many of those, I have read many of those have to deal with health care. So, he's going to replace this with a plan that allows you to buy insurance across state lines, that is much more centered around the patient, and access to health care, but -- and I wish I had heard more of that from the women yesterday here in Washington. Why aren't they talking about the millions of women who live in poverty, who don't have health care after eight years of President Obama? STEPHANOPOULOS: What did the president think of that march? CONWAY: I discussed it with him briefly. We respect people's first amendment rights. But frankly didn't see the point. I mean, you have a day after he's uplifting and unifying. And you have folks here being on a diatribe where I think they could have requested a dialogue. Nobody called me and said, hey, can we have a dialogue? And you have celebrities from the podium using profanity-laced insults. You have a very prominent singer who is worth hundreds of millions of dollars not going over to women shelter here in D.C. to write a check, but instead saying that she thought of, quote, burning down the White House. CONWAY: Well, this is destructive. And I read in an article or two that the Secret Service may be investigating that. But, George, we just had an election. And a lot of what I heard from this march yesterday in Washington, we heard all through the election. And that whole messaging, and their candidate, Hillary Clinton, lost. 29 to 30 million women voted for Donald Trump. Their voices are heard as well. They should be respected. I just thought they missed an opportunity to be about solutions and to really fight for those millions of women whose kids are trapped in failing school, who don't have access to health care, who don't have access to an economic, affordable life. And those are the -- those are the people that we're here for, the forgotten men, the forgotten women and their children. And I just thought it was such a contrast to have President Trump deliver an inaugural address that was so uplifting and aspirational and inclusive of America if you open your heart to patriotism, there's no room for prejudice, and then the very next day, you have these profanity-laced, threatening, vulgar comments coming from the podium. The whole celebrity thing didn't work for Hillary Clinton. She tried that in her campaign and it failed. their absence yesterday? President Obama, Secretary Clinton, they were up on the platform applauding and embracing President Trump. They weren't here marching with women. You mentioned a couple hundred thousand people who sent in petitions on health care, talking about health care, you also have more than 200,000 who petitioned the White House calling on President Trump to release his full tax returns with all information needed to verify emolument's clause compliance. Whenever 100,000 petition, that triggers a White House response. So, what is the White House response? CONWAY: The White House response is that he's not going to release his tax returns. We litigated this all through the election. People didn't care. They voted for him. And let me make this very clear. Most Americans are very focused on what their tax returns will look like while President Trump is in office, not what his look like. And, you know full well that Trump -- President Trump and his family are complying with all the ethical rules, everything they need to do to step away from his businesses and be a full-time president. But on this matter of tax returns, people keep a -- they want to keep litigating what happened in the campaign. People want to know that they're going to get tax relief and he has promised that. We just hope the Democratic Senate will support his tax relief package the way the Democratic Senate in 2001 did for President Bush, George. They passed tax relief for all Americans by June of that year. We hope the same happens here. President Trump has appointed 21 of his 21 cabinet nominees and only two have been confirmed. It's really time for Democrats to step up and stop talking about bipartisanship and be bipartisan when it comes to passing that tax reform so that Americans' tax returns look better this year and confirming these nominees. We need a Treasury secretary. We need a Commerce secretary. We need a new government that works. And we hope they'll -- they'll meet the call very soon. Just for the record, I knew that The Office of Government Ethics has cleared Jared Kushner, saying he's in full compliance. There are still questions of the overall conflict of interest rules with the White House right now and the president. But we do not have time for that today. Kellyanne Conway, thanks very much. STEPHANOPOULOS: Coming up, a response from the opposition -- Democratic minority leader Chuck Schumer is here; also, Republican John McCain. STEPHANOPOULOS: On Friday and Saturday here in Washington, DC, we're joined now by the Democratic leadership in the Senate, Chuck Schumer. SEN. CHUCK SCHUMER (D-NY), MINORITY LEADER: Hi, George. STEPHANOPOULOS: We just heard from Kellyanne Conway. I want to talk about a couple of things that she said, including the president's statement at the CIA yesterday, which drew some fire from the former CIA Director John Brennan. She fired right back and said it was remarkable. SCHUMER: Well, here's what I'd say. To stand on sacred ground, the wall which commemorates CIA agents who gave their lives to the country and then talk about what he talked about, was so, so wrong. President Trump ought to realize, he's not campaigning anymore. He's president. And instead of talking about how many people showed up at his inauguration, he ought to be talking about how many people are going to stay into the middle class and move into the middle class. STEPHANOPOULOS: What did you make of his inaugural speech? We also heard Kellyanne Conway say -- describe it as a -- a unifying speech. That is their view. SCHUMER: Yes, it was not at all. He spoke only to his supporters. The grand tradition of these speeches is very simple -- unify people, reach out to people who didn't vote for you, when, of course, the majority of people didn't vote for Donald Trump. But instead, he just spoke to his supporters. And the other thing that bothered me about the speech, George, as much as sort of the narrowness of it and the darkness of America that he portrayed was this. I think he's trying to use populist rhetoric to cover up a right-wing agenda. If you look at this cabinet, they are far from the populism that he talked about, people like Price, who want to end Medicare as we know it by privatizing it. Mulvaney cut the smithereens out of every program, even research, for cancer. DeVos, who wants to end public education funding, or not end it, but greatly curtail it. STEPHANOPOULOS: As you heard, the White House is saying you're not acting fairly by moving so slowly on these confirmations. President Obama had far more cabinet officials in place on his first day. SCHUMER: He did. That's because this is a difficult cabinet than we've ever seen. We call it a swamp cabinet -- billionaires and bankers. And the rea -- so many of them have potential conflicts of interest. The one Obama cabinet appointee who had this kind of wealth and potential conflicts of interest, Penny Pritzker, took six months. And these people have to divest themselves of conflicts of interest -- that's the law -- before they come in. They were not properly prepared. They were not properly prepared. Many of them, they tried to hold hearings without even their papers, their conflict of interest plans and their ethics reports, their FBI reports being available. You know, advise and consent doesn't mean ram it through. Now, if I were the Republicans and President Trump, I'd want to ram these cabinet ministers through -- or nominees through, because so many of them have conflicts of interest and so many of them have views inimical to what the American people want and Trump campaigned on. STEPHANOPOULOS: You mentioned the cabinet. What about President Trump himself? You just heard Kellyanne Conway say he's not going to release his tax returns, he's sticking by that position. Some ethics experts believe that his plan to divest -- to give it over to his sons, not divest, did not go far enough and that he will be in violation of The Emoluments Clause. SCHUMER: Well, The Emoluments Clause has never been tested, because we've never had a president who's refused to give up his personal investments and other things. My advice to President Trump, get rid of it. It could cause you real trouble. We don't know if foreign aid comes from, you know, goes to a country that has Trump hotels in it, whether any of these clauses are violated. SCHUMER: -- and he's risking a lot. But were you comfortable with everything you heard? You heard Kellyanne Conway right there and I think she spoke for a lot of people when she talked about those comments from Madonna, talking about burning down the White House? SCHUMER: Yes, look, I don't agree with those comments, but the celebrities don't matter in this march. I marched in New York. I saw hundreds of thousands of people. I didn't see a single celebratory. I saw a voting people, men and women, worried about women's health. If they repeal The Affordable Care Act, women will no longer be required to be treated equally. They repeal Planned Parenthood, women's health is at risk. They're even talking about undoing "Roe v. Wade." So women had a right to march. That's part of the grand American tradition. And I'll tell you, the depth and sincerity of the protesters that I saw really fortified me. I get a lot of strength from this and I think there's going to be a lot of Americans who are really willing to be much more active than they were before, because they're worried about where Trump is headed. STEPHANOPOULOS: You saw President Trump sign that executive order on Obamacare Friday night. Kellyanne Conway just said he may stop enforcing the individual mandate. SCHUMER: Well, look, that -- they don't know what to do with The Affordable Care Act. Who would have thought two weeks into this Democrats would be united and on offense and Republicans would be on defense? The public knows how many good things there are as part of the Affordable Care Act. The Republicans say they're going to repeal. They don't know what to replace it with. I even think his executive order exemplified that. They didn't say anything. They said, keep the good things, get rid of the bad things, but obey the law. That's because they don't know what to do. They're like a dog that caught the bus. STEPHANOPOULOS: Let me ask you about Russia. President Trump suggested in an interview that he may seek a deal with Vladimir Putin, where he would lift the sanctions -- President Trump -- in return for an nuclear arms reduction. Is that a deal you could sign onto? SCHUMER: That would be horrible. And, in fact, we are so averse to it that Senator Cardin and I are introducing legislation this week to say that, before the president could reduce any sanctions on Russia, that it would have to be passed by Congress. STEPHANOPOULOS: He does now have that authority on his own, doesn't he? SCHUMER: He does. And but we have bipartisan support. Senators McCain and Graham are supporting this legislation. And for us to repeal sanctions, given what Russia has done in Ukraine and threatened the Baltics and, now, they have clearly tried to intervene in our election-- whether it had an effect or not, that is something -- that’s a danger that we have never faced to this extent in American history. So this legislation, I hope, will get bipartisan support. You know, a mirror thing happened a few years ago. Republicans were worried that President Obama would lift the Iran sanctions. They introduced legislation that he couldn't, without congressional OK; got 90 votes. I voted for it. STEPHANOPOULOS: Final question: we now know the intelligence agents are looking into possible contacts between the -- any Trump associates and the Russians during the campaign. You heard Kellyanne Conway deny it right there. She also said the White House would not interfere with these -- this investigation. You confident that’s the case? SCHUMER: I hope so. And it would be dramatically bad if they did. Bottom line is we should have a thorough investigation of all the allegations. They are really serious. STEPHANOPOULOS: Senator Schumer, thanks very much. SCHUMER: Thanks, George. Good to be here again. STEPHANOPOULOS: And let's take this right to Senator John McCain. He joins us as well this morning. Senator McCain, thank you for joining us this morning. You heard Senator Schumer just invoke your name on the issue of Russia, Russian sanctions. What is your take on that possible deal that President Trump has floated? SEN. JOHN MCCAIN (R), ARIZONA: Well, I’m deeply concerned about our relationship with Russia. I believe that the president has around him a national security team that is very concerned as well. All of them, whether it's General Mattis or General Kelly or General Flynn or my good friend, Dan Coats, view Russia as our major challenge. They have committed war crimes. They have. When you have airplanes with precision weapons, striking hospitals in Aleppo and slaughtering innocent men, women and children, you're committing a war crime. So we need more sanctions against Russia. We should not relax them. If we have peace through strength -- and, by the way, rebuilding our military is one thing that I’m excited about this administration and General Mattis. But, if we don’t keep those sanctions on and even increase them, it will encourage Vladimir Putin, who is a war criminal. STEPHANOPOULOS: When you mentioned the president's national security team, you didn't mention his nominee for secretary of state, Rex Tillerson. Have you decided how you're going to vote on his nomination? STEPHANOPOULOS: How did he assure you? MCCAIN: Well, he talked to me a lot about his views about Russia, about the events that have taken place, about the fact of what his duties were as a head of one of the world's largest corporations. Listen, this wasn't an easy call. But I also believe that, when there's doubt, the president, the incoming president, gets the benefit of the doubt. And that's the way I have treated every president that I have had the obligation to vote for or against as a member of the United States Senate. STEPHANOPOULOS: And on the issue of Russia, are you confident that all these investigation, the investigations by the intelligence agencies now, the investigation by the FBI, the congressional investigations, are going to get to the bottom of what happened in this election? MCCAIN: It may. But the best way to do it is with a select committee or a select -- or a commission. What the Russians did was imperil the very fundamental of a democracy and that is to affect the election. I don’t believe there is any evidence that they did. But the attempt was very sophisticated. The attempt was much more far-reaching than we had ever anticipated. And so there has to be a full and complete investigation. And that should guide our relations to a large degree with Russia. STEPHANOPOULOS: You heard both Kellyanne Conway and Senator Schumer weigh in on both the president’s inaugural speech and that speech yesterday at the CIA. MCCAIN: Well, my take is that obviously I disagreed with some of the things that the president-elect said. But the point to me is not what he's saying because we keep reacting to just things he says in his tweets. What he is doing is important. And I have the utmost confidence in General Mattis, General Flynn, General Kelly, Dan Coates. I couldn't have picked a better team. And so I’m confident that he will listen to them and be guided by them. As far as this back-and-forth on his tweets, that's an endless rabbit hole. STEPHANOPOULOS: You say you have utmost confidence in his team. Do you have utmost confidence in President Trump? MCCAIN: I do not know, George. I do not know, because he has made so many comments that are contradictory. But I think the fact that he’s appointed and nominated these outstanding individuals is bound to be an encouraging sign. I trust the and believe in them and have worked with them over many years. STEPHANOPOULOS: Finally, you also heard Senator Schumer say he thinks that President Trump has to go farther on getting rid of his businesses. He thinks he has to fully divest. And if he doesn’t, he’s putting himself at risk. MCCAIN: I think that's up to more experts than me. But clearly, I think his tax returns have always been a tradition that should be observed. And, by the way, on this march yesterday, it's also a testimony to the power of social networking. This wasn't big on ABC News. But it was networked all over the country. And it was a pretty remarkable turnout. STEPHANOPOULOS: What did you think of it? MCCAIN: I think it was remarkable. And I think it's an urgent plea for us all to sit down together. The world is on fire, George. We have seen -- we're in more danger than we have been and the -- our adversaries are increasing their military capabilities dramatically closing the gap. We need to work together, as we do on the Armed Services Committee, I’m happy to say. STEPHANOPOULOS: Senator McCain, thanks for joining us this morning. STEPHANOPOULOS: We will be right back with the roundtable. STEPHANOPOULOS: Images there from this inaugural weekend. President Trump on the parade. And there he is, that clenched fist after the inaugural speech. A lot to talk about with our Roundtable. We're joined by our ABC News team, White House correspondent -- chief White House correspondent, Jonathan Karl; Cokie Roberts; and our chief political analyst, Matthew Dowd; along with Republican strategist Alex Castellanos; Democratic strategist Stephanie Cutter. And I don't know exactly where to begin, Jon Karl, but as someone has said, he's seen 10 presidents in the Briefing Room, 10 White House press secretaries. You saw my back and forth with Kellyanne Conway right there. And I'm the first person to say I don't care that much about crowd size either. STEPHANOPOULOS: But we did have these speeches yesterday on the first full day in office for the president. And the press secretary that were just not factual. JONATHAN KARL, ABC NEWS CHIEF WHITE HOUSE CORRESPONDENT: Look, on his very first appearance in the Briefing Room, Sean Spicer went in and he uttered at least three things that were demonstrably false. And then -- and I think the biggest problem, he left without taking a single question. I've never seen a White House press secretary do that. That said, I think that we need to be careful, as reporters and as journalists, not to take the bait and not to get into an endless discussion about issues that are trivial -- how many people were there, the crowd size, just not important. He had a huge crowd. KARL: -- by telling the truth is absolutely important, especially from that podium. Sean is no longer the RNC spokesperson. He's no longer (INAUDIBLE) spokesperson. He is speaking on behalf of the White House, of the executive branch of the United States. Credibility matters. STEPHANOPOULOS: But Alex Castellanos, I want to -- I want to bring this to you, because I wonder, some said something about the functioning inside the White House. You saw immediately in "The New York Times" this morning people suggesting that Donald Trump thought that Sean Spicer went too far. So already, you've got his colleagues throwing him under the bus. ALEX CASTELLANOS, REPUBLICAN STRATEGIST: It's a -- it's going to be a tough job for the next four years, being the spokesman for this administration. President Trump's style is very different than we've seen in any other presidential leader. He pushes the ball way past the 50 yard line. He's a negotiator, not a reciter of facts. You know, he's the guy -- he's -- again, he's going to buy that car. He goes that's the worst car in the world. STEPHANOPOULOS: But is that acceptable? CASTELLANOS: Well, it's a different way he's used to dealing with the world. That's the worst car in the world, I'm not going to give you all that money for it. The germ of truth is that he's trying to tell you something else and just looking at it on that micro level is not going to help you understand what's really going on with a Trump administration. STEPHANOPOULOS: I couldn't disagree more. ROBERTS: Well, no, no, no, no. STEPHANOPOULOS: -- what are we supposed to do? CASTELLANOS: -- he's right, but that's the way to deal with this is what's the larger truth here? STEPHANIE CUTTER, DEMOCRATIC STRATEGIST: Yes. CUTTER: -- except -- there cannot be -- maybe it is the new normal where a press secretary takes the podium and blatantly lies, when a president goes to the CIA as the commander-in-chief and blatantly lies. But it shouldn't be. Now we're in a position where every time Sean Spicer takes the podium or the president says something, they don't need to just be fact-checked, you have to presume that they're not telling the truth. And that is -- that is a very different normal compared to we -- I've worked for two presidents. I've spoken for two White Houses. And that has never ever been the case. MATTHEW DOWD, ABC NEWS POLITICAL ANALYST: Well, I may be a little old-fashioned, but I actually believe that if you live and work in our house and you work on our payroll and you take oaths, then integrity matters in elections. DOWD: And what we have always see with spin was we see the three sisters of spin, right? We normally see misrepresent, mislead and mistake. We normally see that. But what you're seeing now is Mr. Lie, right, Mr. Lying in the course of this. To me, what you observed from Donald Trump -- and you've heard this from Donald Trump all the way up until he was president. Now you're hearing it as president, and from Sean Spicer is, are you going to believe me or your lying eyes? DOWD: And what they should have said yesterday -- this would have totally (INAUDIBLE) it -- what they should have said is Thomas Jefferson said the highest form of patriotism is dissent. And what we saw with the marchers was what makes America great -- peaceful protests and exercising your constitutional rights. CUTTER: -- the White House. STEPHANOPOULOS: I take that point. But let me put this question back at -- back to Jon Karl. It wasn't just not telling the truth from the podium, it's when questioned, he says that the people questioning him are not telling the truth and everything that's a question is fake news. KARL: Yes, and, you know, the reason he has this obsession over what seems like such a trivial issue on the crowd size is that at every step Donald Trump has been -- his legitimacy has been questioned. First, is he going to run for president? Oh, he's leading in the polls now. That won't last. Oh, we'll beat him at the convention. Oh, we'll beat him at the Electoral College. He lost the popular vote. KARL: -- here. So he sees this as another step in questioning whether or not he is a legitimate president. KARL: He is the legitimate president. KARL: He'll be better for him if he moves beyond this. CASTELLANOS: But the war has not ended. The campaign has not ended. Donald Trump has had no honeymoon because there's been no marriage. That speech he gave was -- the inaugural speech was not a call for unity, it was a call to overthrow the establishment that he sees, and I would agree with him, has failed in Washington. STEPHANOPOULOS: He seems to be betting on the idea that he defy -- define reality, in some cases by denying it. CUTTER: Right. You know, to Jon's point that he feels like he doesn't get the credit for being a legitimate president. That's -- we can psychoanalyze Donald Trump for the entirety of the show. He should have therapy over that legitimacy thing. He is now the commander-in-chief of all Americans. And as a commander-in-chief what you do and what you say has real consequences. You know, our friend, David Axelrod saying on the day that we walked in the White House, now what we say and do, we can send armies marching and stocks dropping. And we saw that with Donald Trump the other day. He caused the dollar to drop. But there are consequences now. STEPHANOPOULOS: John McCain: pretty striking that he said he doesn't know if he has confidence in President Donald Trump. DOWD: He said very clearly, I have confidence in people that he's appointed. And he said very clearly, also, I don't know if I have confidence in the president of the United States. that marched around the country in opposition mainly to what he is and who he stands for. But at some point, you have to be the person that is bigger. And what I've watching in the course of this is most of us have said, we're going to give him a chance. Let's give him a chance. He's got elected now, let's watch the transition. And then let's watch his transition, it didn't turn out all that great, according to most people, and how he was going to unify. Let's watch the inaugural address. And every single step of the way, now as president of the United States, instead of getting bigger and the office holding him up, he's gotten actually smaller in the course of this, even more petty. You go to the CIA and have a petty argument about crowd sizes and attack the press, you're not being big, you're being small. ROBERTS: Something is likely to happen that really gets his attention. Because, as President Obama kept saying, you get in this office, and things start to change. And, I think that -- some -- some consequence, as Stephanie said, will occur. STEPHANOPOULOS: Well, on that point, Jon Karl, most presidencies end up being defined not by what to do, but by what happens to them, how they react to it. terms of his agenda, he has set forward a bold agenda. He is breaking not just with the previous administration, he's breaking with the Republican leadership. That inaugural speech was a declaration of independence from both parties. And, you know, I mean, we don't know how this is going to end. STEPHANOPOULOS: Now he has got to fill in the blanks. CASTELLANOS: But his success is not going to be determined by what he said about crowd size, his success is going to be determined by whether he can transform Washington, and whether that change that he brings, whether that grows the economy and makes America safer in the world. There's no way he could have given the speech Friday during the inaugural that would have unified the country. But he's going to take this country in a very different direction. STEPHANOPOULOS: Stephanie, that leads to a question about the marches yesterday, as well. Is this really going to turn into a movement that puts pressure on President Trump, more importantly it puts pressure on Democrats? ROBERTS: A few brave men. CUTTER: More than a few, and children, frankly. ROBERTS: And women of all ages. The pictures. the cold when you repeal the Affordable Care Act. We don't want our rights rolled back. These are serious things that Republicans in congress, most particularly, need. ROBERTS: I think it's really with any -- with the enthusiasm that existed yesterday, which was truly remarkable. STEPHANOPOULOS: But does it last? ROBERTS: That's the question -- I think they really can create a movement, because they've come to -- a lot of women have come to understand that you can't just show up and say I'm unhappy, you have to then go out and do something. And there's a lot of talk about more women running for office, more women supporting people in office, all that, turning it into a political movement. DOWD: I think that I'm just going to repeat what something Donald Trump said for the last 18 months and Kellyanne Conway and everybody around him has said, you guys are missing what is going on. Look at the crowd sizes, right? And as I look at what happened yesterday, we cannot underestimate the idea that across city across city in the United States and around the globe, millions of people stood up, men and women, and it was very young. I walked through some of it in Washington. I walked through some of it here. It's people that have never involved before. In all of these movements, they start with a broad strategy and what are you doing to do and how are you going to do it, they start with a moment and it surges. And then what happens from that, people figure out the strategies. CASTELLANOS: ...is not a creation of Donald Trump in just this moment. The gender gap -- I remember the god old days, it used to just be in the home. And now, of course, battles for power fought where power resides, as power has moved into the economy for working women and into politics, right, we want our government to be both a nurturing, more feminine government, but we want it to be this tough daddy bear that enforces strict rules. As that -- as there's more power in government, the gender war has moved there. This was the most divisive election in terms of gender we have seen. I think that's only going to get worse. reaction to change. What Donald Trump is, is not movement of change, it's a reaction to global change, it's a total reaction to global change. It's transformational change in the world done by the -- it's by transportation, technology and all that. And people, most of Donald Trump's voters -- Alex, most of Donald Trump's voters want to go back. CASTELLANOS: No, that's not true. STEPHANOPOULOS; It may not be true in your view, but that is all we have time for right now. We've heard a lot of talk from the roundtable, also from the president this week, a week of action. We're going to cover that as well. And we'll be right back. STEPHANOPOULOS: That is all for us today. Thank you for sharing part of your Sunday with us. Check out "WORLD NEWS TONIGHT". And I'll see you tomorrow on "GMA".